The Secretary-General of the International Maritime Organization – the United Nations agency concerned with maritime safety and security and the prevention of marine pollution from ships – has been awarded an honorary doctorate from Plymouth University. 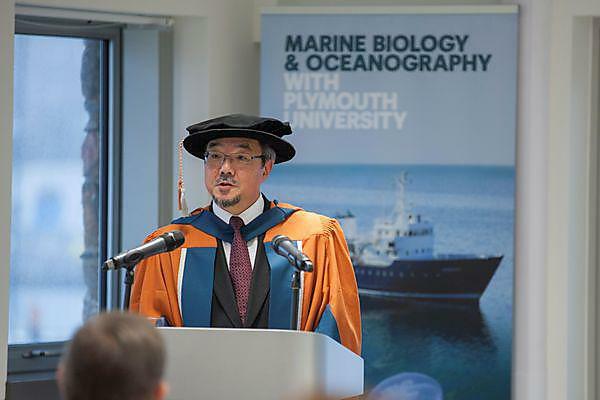 Koji Sekimizu received an Honorary Doctorate of Business at a special ceremony held at the University’s Marine Station teaching and research facility in recognition of his 40-year career in the sector. Mr Sekimizu, from Japan, has held a number of roles at the IMO, and was elected its seventh Secretary-General in 2011. He has led the development and implementation of a significant number of international rules and regulations in relation to maritime safety, security and protection of the marine environment. As part of the ceremony, Mr Sekimizu took a tour of the Marine Station, which was formally opened by HSH Prince Albert II of Monaco in October. He then offered a keynote address in which he spoke about his life at the IMO, and his perspective on maritime heritage and history. The IMO has its headquarters in London, and comprises 171 member states and three associate members. Mr Sekimuzu joined in 1989 as Technical Officer from the Ministry of Transport in Japan, and since then, has had various roles within the organisation, including heading up the Technology Section; Director of the Marine Environment Division; and Director of the Maritime Safety Division. Among a number of honours he has received, Mr Sekimizu is an Honorary Member of the International Federation of Shipmasters' Associations, an Honorary Member of the Master Mariners Association, a recipient of the Golden Anchor Award for Lifetime Achievement, the Halert C. Shepherd Award from the American Chamber of Shipping, and the Order of Maritime Merit, from France. He has also been awarded the Monja Blanca Medal from Guatemala; the Order of Sikatuna, Grand Cross, and Gold Distinction from the Philippines; the Order of Naval Merit, Grand Officer from Brazil; the Officier de l'Ordre du Mérite Ivoirien from Côte d'Ivoire; the Order of Bernardo O'Higgins, Grand Officer from Chile; the Order of the Peruvian Cross for Naval Merit from Peru; and the Distinguished Public Service Award from the United States Coast Guard. Professor David Coslett, Interim Vice-Chancellor, said the University was honoured to add its own recognition of Mr Sekimizu’s achievements.